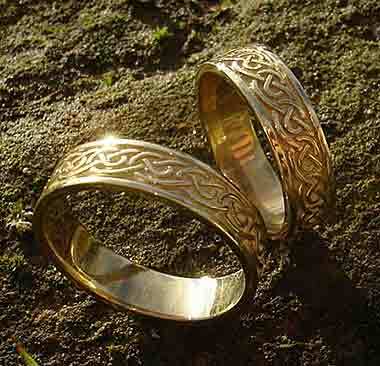 CELTIC WEDDING RINGS : SCOTTISH Made : LOVE2HAVE in the UK! The BEST! Quality men's and women's gold Celtic wedding rings made in Scotland and the rest of the UK for him and her at the lowest prices. Like the Celtic engagement rings section, this section of our website is by far the most traditional jewellery we feature, but very popular still with our customers. Skilled craftsmen and women make all the rings listed by hand on the Scottish islands of Shetland from either 9ct white or yellow gold. All the white gold Celtic wedding rings come in their off-white natural colour. Visitors to this section of our website may also wish to consider our Celtic engagement rings, and many of the rings listed here are also available in sterling silver which you will find in our silver Celtic rings category. On a final note we are very confident in that not only do we provide the BEST gold Celtic wedding rings for men and women made here in the UK (and probably the world) but also at the LOWEST PRICES too. If you think you may have seen the same Celtic wedding ring elsewhere at a lower price, let us know, and we will price match like for like. YES! We can BEAT anyone!